Traveling around Saigon in style! We have been importing from Vietnam for several years now, but I had been doing my buying via email from a supplier referred to me by a friend. I had been hearing about great deals to be had there on everything from silver jewelry to textiles, so I decided to check it out for myself. 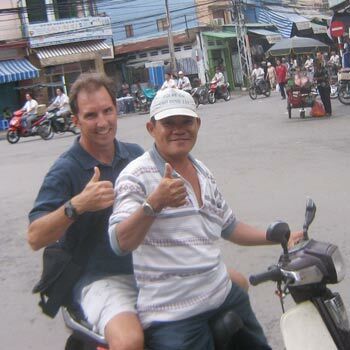 Since I was pressed for time, I limited my excursion to Saigon, also called Ho Chi Minh City. Saigon is the capital of this up-and-coming export powerhouse, so I expected high rises and traffic, similar to what I see in Bangkok. What I found was decidedly less high-tech, and somehow more reassuring. Thousands of motorcycles cruise the streets, interspersed here and there with cars. There aren't any buildings more than about 10 stories tall, and the pace of life is slow and relatively peaceful considering how many people live in the city. As with many Asian countries, it is not unusual to see a whole family (Dad driving, Mom on the back and a kid or two sandwiched in the middle) precariously balanced on two wheels. The most people I’ve seen on one motorcycle is five (in India), but I’m always looking for a new record-breaker! Usually when I start out in a new market, I begin with shops that cater to tourists to get a feel for overall quality and range of merchandise. Often among the touristy schlock are hidden gems that will translate to what I like. I had tried to establish contacts with wholesalers before I arrived, but the pickings on the internet are pretty slim for the handicrafts and jewelry I find so plentiful in Thailand. Prices were slightly less than I pay in Bangkok for similar items, but finding more than a handful of potential products was proving difficult. I walked and walked, scouring the high-rent district, bargain outdoor markets, and everything in between. Along the way I had to dodge various taxi and motorcycle drivers trying to scam me out of a dollar or two. And there just didn’t seem to be the range of items I would liked to seen: either the prices were crazy or the quality was lacking. Eventually I found a silk textile manufacturer with a small shop catering to visitors and wholesalers alike. He had some products I buy elsewhere, plus some new items that struck my fancy, all at good prices. Best of all, he was able to arrange shipping at an affordable price—no easy feat in a place where Fedex charges $18 per kilo (compared to $6 in Bangkok!). 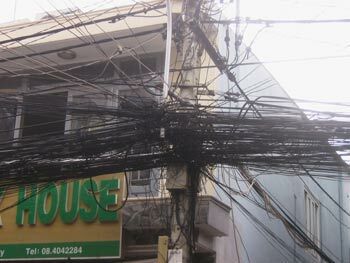 Saigon calling... My phone isn't working, can you come fix it? What I was really hoping to find was home accessories in silk. My newfound supplier had a nice selection of clothing and handbags but no duvets or curtains. On the plane to Bangkok, I spoke to another importer who casually mentioned an industrial area near the airport with lots of wholesalers. It seems like that's how it goes: the best intel turns up on the way out, not on the way in.